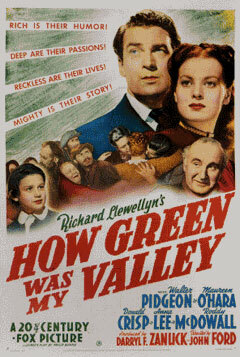 Manipal Film Study Centre will be screening the documentary film How Green Was My Valley , 1942 , English,Welsh. At the turn of the century in a Welsh mining village, the Morgans (he stern, she gentle) raise coal-mining sons and hope their youngest will find a better life. Seen through the eyes of Huw, we learn of the family’s trials and tribulations. Family patriarch Gwyllim and his older sons work in the mines, dangerous and unhealthy as it is. Huw has his own ideas on how to honor his father. Daughter Angharad is the most beautiful girl in the valley and is very much in love with Mr. Gruffydd who isn’t sure he can provide her the life she deserves. Times are hard and good men find themselves out of work and exploited by unseen mine owners.